Welcome to “Slim Spurling’s Universe”! 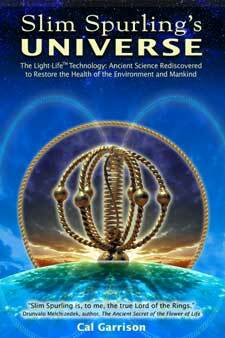 This is the official website for Slim’s book, “Slim Spurling’s Universe – The Light Life Technology™: Ancient Science Rediscovered to Restore the Health of the Environment and Mankind”. From his early beginnings back in Aberdeen, South Dakota, Slim’s life has been quite a ride. This remarkable man is tuned into life in a whole different way. He is a walking, talking, living example of whatever it is about the American “Pioneer Spirit” that we have lost touch with. Slim is also a visionary and a genius, who has known since he was a child that anything is possible. “ Slim Spurling’s Universe” is a documentation of a lifetime of research that up till now has only been passed on orally in workshops, seminars, and conferences all over the world. Who could believe that it would be a “Hillbilly Cowboy” from the Northern Plains who would be the one to develop the technology to clear up 80% of the pollution on the planet? What’s inside these pages is the first written record of everything Slim Spurling has done. (click on the links below).